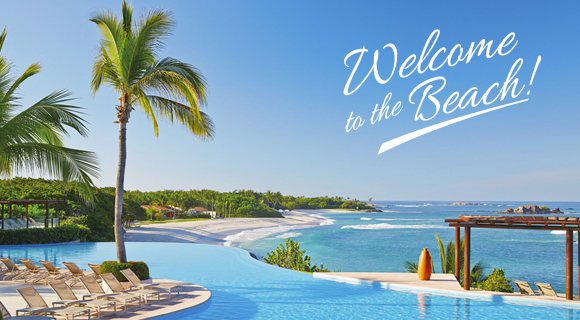 Riviera Nayarit Mexico Blog: Pre-Summer Promos Have Arrived In The Riviera Nayarit! Pre-Summer Promos Have Arrived In The Riviera Nayarit! These include discounts of up to 56%, no-interest payments for up to 3, 6 or 12 months, up to two kids free or 50% off children under 12, and many other amenities on a complimentary basis. Pre-Summer Promos have already begun in the Riviera Nayarit, meaning visitors will find special pricing across the destination from now until June 14, thanks to a collaboration between associated hotels and the Marketing Department of the Riviera Nayarit Convention and Visitors Bureau (CVB). Participating hotels include: Bel Air, Dreams Villamagna, Grand Palladium, Grand Sirenis Matlali, Grand Velas, Hotel Las Palomas, Iberostar, Imanta, La Tranquila, Marina Banderas Suites, Ocean Breeze, Paradise Village, Rancho Banderas, Riu Jalisco, Riu Palace, Riu Vallarta, Royal Decameron, Samba, St. Regis, Villa del Palmar, Villa La Estancia, Villa Varadero, Vista Vallarta, Hard Rock Hotel, Hotel Cinco, Marival Residences, Marival Resort Occidental Grand, Royal Suites by Palladium and Decameron Los Cocos.